Compatible with your camera with standard 1/4″ screw thread fitting. Lockable head positions in tripod mode (up to 110 degrees), together with rubber feet for more stability. Adjustable joints to transform from tripod stand to an ergonomically designed pistol grip to reduce camera wobble and offer better pictures or video. Compact, lightweight and durable. Tripod stands 10cm tall and weighs just 85g. The iGadgitz 2 in 1 Pistol Grip Tripod is a great accessory for your camera. It weighs only 85 grams and its pocket size makes it perfect for travel. 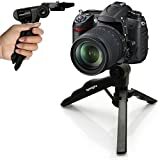 Can be used as a mini table top tripod with locking tripod head of 110 degrees of movement, or as a pistol handheld grip to help you record videos and take photos with less camera shake.